View of the top cage. The top cage is made from a 10" cardboard QuickTube section, with rings (circular inside, octagonal outside) of 1/8" high-density fiberboard for strength. It's very light and stiff. 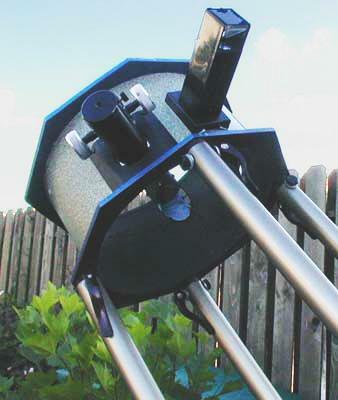 The secondary is a high-quality 1.55" from Crazy Ed, mounted on a 3-vane spider and secondary holder from Protostar. The focuser is JMI's new lightweight 1.25" low-profile Crayford; it's the best combination of weight and quality I've found, and is very reasonably priced. I use a Rigel Quickfinder as the finder; normally I don't like these as much as magnifying finders, but for this 'scope I needed something very light, and the Orion EZ Finder I first intended to use didn't stick out enough, so I kept bumping my head into the truss tube trying to look through. The Quickfinder has a quick release (which is recalcitrant -- I can't release it with my fingers, but I can usually pop it open with a coin) and comes off to enable the top cage to nest in the mirror box. The top cage is held on to the tubes using bicycle quick-release type clamps. The ones here actually came from Astrosystems, but they're somewhat expensive and took a long time to get here, and next time I'm just going to go to a bicycle shop. 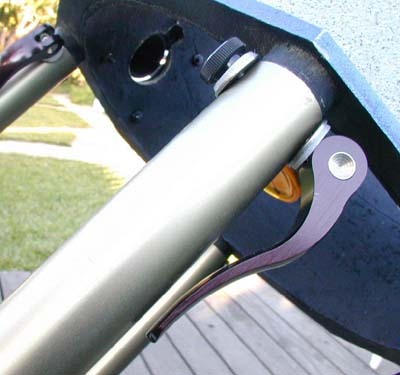 The tubes have a slot cut into their top ends, and the upper cage has dowel stubs about 1" long which fit loosely into the tubes, through which the quick-release bolt runs; the quick-release clamp slides into the slot, then the lever is rotated down to tighten the bolt. Assembly is very quick, except that I wasn't quite accurate enough in getting the slots centered in the tubes (I made them with a cutting wheel on a Dremel tool) and sometimes I have to wiggle things a bit to get the QR bolt to slide into the slot, depending on which tube ended up in which position. I'm gradually working out bugs like this; I'm determined to make it work with any tube in any position, so I don't have to number the tubes. The secondary cover (just barely visible behind the nearest clamp) is a plastic prescription pill container.